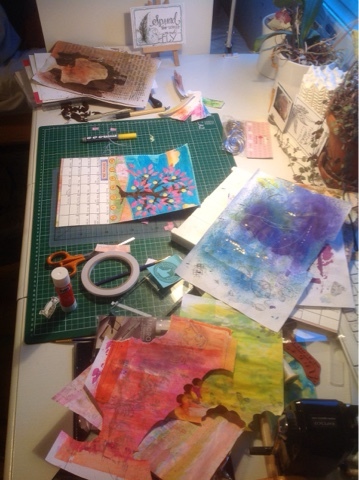 It's Wednesday, and I'm posting for WOYWW (What's on your workdesk Wednesday), the worldwide crafty deskhop hosted by Julia at the Stamping Ground. I'm starting to really feel it's dark in the mornings... and the evenings too! I've been working on my last calendar page for September. Happy it's almost done, I'm hoping to get it posted later today. The paper piecing always results in an awful mess! If you look closely, you might find my brand new Brusho swatch spread out, waiting to be used. I decided not to stick them in my art journal (like the Bister swatch last week), because I can imagine buying more colours... so I punched a hole in the strips and put them on a ring. Good idea to make up a swatch I must say. Aren't they gorgeous colours, all these powders! Love the September page, worth the trouble of the paper piecing for sure! What a clever idea to keep a swatch of colours! That September page is really lovely, it must have taken you ages! Hi Kristiina - just popping back to answer your question. I cut the dragonfly out of a napkin. I buy them on eBay. They're great for collage. Have a nice evening! Beautiful colours! Sounds like a really great calender.